" we cannot survive without natural forest"
It is truly fascinating to learn about the different indigenous people living in Chittagong and other forest regions in our country. Our educational journey puts us one step ahead every time we try acquiring new ideas and knowledge about such communities. I believe that if we can preserve the tradition of the Chakmas, Garos or the Murongs with their lifestyles galore then Bangladesh would certainly earn the credit of owning a unique culture (J. Iftekar, 2004). Practices and innovations developed by the indigenous peoples, which contribute to the sustainable use of biological resources and conservation of biodiversity should be recognised, rewarded; states should control or eradicate "alien" species which threaten ecosystems, habitation or species and states should adopt measures for the recovery and rehabilitation of the endangered species and for the reintroduction into their natural habits. ADB project designed primarily to increase the production of fuels and enhance the institutional capacity of the Forest Department and the thana administrations in implementing a self-sustaining nation-wide social forestry. According to the appraisal report, the most common exotic species selected for woodlot plantations include Eucalyptus spp.,Dalbergia Sisso, Leucaena leucocephla, Swietenia macrophulla, and Leucocedepha swieternia. 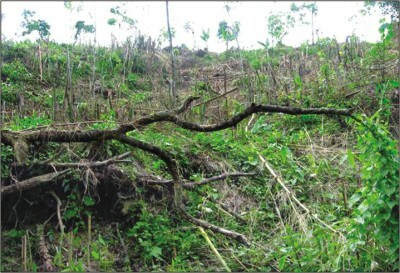 The ADB claims that the exotic species selected for woodlot are well adapted to tropical conditions with high rainfall and with the adequate combination of nitrogen-fixing understory vegetation and soil treatment can be planted without fear. But past plantations show all negative results. The exotic species grow faster than the natural trees, so they can replace the natural Sal or other local species. This view has been rejected by the local people who are aware of the long-term benefits of natural Sal or other trees, because the natural trees are so diversified that they not only supply timber and fuelwood, but also medical plants and habitat for rare wildlife. In the first place, the Forest Department is attempting to take our lands, which we have cultivated for generations. In the second place, we do not trust the Forest Department. We are the witnesses of how the corrupt elements in the Forest Department have destroyed the forest in collusion with the business interest. What we have seen in the past few years is incredible. When the Forest Department decides to establish a woodlot block, it just comes with hired labourer, they start cutting the coppies of Sal (Shorea robusta) and within a few weeks, all coppies are cleared. This is ecocide caused by the Forest Department. And this is how the Forest Department degrades or denudes the forestland for the preparation of woodlock. We, the forest people, are so accustomed to forest life that we cannot survive without natural forest, and we will be gradually evicted from the forest land as woodlot plantations are replacing the natural forests... We grow rice, pineapples and other crops on our croplands, but we never destroy natural forest. Because we know that natural forest is very significant and much more beneficial than the forest established with exotic species (imported varieties). Amidst strong protests, the government has decided to go ahead with the Tk 11-crore 'Eco-park' project in Moulvibazar allegedly evicting hundreds of tribal families in the process. Minister for Forest and Environment Sajeda Choudhury will lay the foundation stones of the two separate Eco-parks in Madhabkunda and Muraichhari, both in Moulvibazar district at 11am today. At least ten 'Khasi punjis' (villages) will be affected by the planned development project of the government as more than one thousand families who have been living in the hills for centuries will be evicted. There are allegations that Forest Department, the implementing authority of the project, has not taken any steps yet to rehabilitate the affected families. Even worse, the decision to go ahead with the project was taken without any discussion with the tribals living in the hills, threatening the very existence of the resident Khasia and Garo tribes that depend mostly on betel leaf plantations in the area for their livelihood. The Forest Department however does not acknowledge that Khasia tribals own any land in the forest. The decision came as a cruel surprise to many as some of the tribal leaders who had recently met high officials in the Prime Minister's office were assured that the project would not be implemented without prior discussion with the 'residents' in the hills. The government plans to develop a tourist garden or better known as 'Eco-park' centring the waterfalls at Madhabkunda and Muraichhari in the deep forests of the Moulvibazar district threatening not only the human habitation but also natural forests. There are allegations that Forest Department, the implementing authority of the project, has not taken any steps yet to rehabilitate the affected families. Even worse, the decision to go ahead with the project was taken without any discussion with the tribals living in the hills, threatening the very existence of the resident Khasia and Garo tribes that depend mostly on betel leaf plantations in the area for their livelihood. The Forest Department however does not acknowledge that Khasia tribals own any land in the forest. The decision came as a cruel surprise to many as some of the tribal leaders who had recently met high officials in the Prime Minister's office were assured that the project would not be implemented without prior discussion with the 'residents' in the hills. The government plans to develop a tourist garden or better known as 'Eco-park' centring the waterfalls at Madhabkunda and Muraichhari in the deep forests of the Moulvibazar district threatening not only the human habitation but also natural forests. A total of 1500 acres of land would be utilised for the park including 667 acres in Madhabkunda and 833 acres in Muraichhari forest lands. The government claims that the project is a part of the 'plan' for economic development as well as preserving the environment by protecting the precious forest habitation including rare animals and birds of the areas. The Tk 11-crore project of the Ministry of Forest and Environment would be completed by the end of year 2004. The cabinet approved the 'bio-diversity conservation' project last July following the Prime Minister's approval on March 6 last year. The project, Madhabkunda-Muraichhari Eco-park, would involve clearing more than 1500 acres of forest including Khasi lands probably by cutting off trees and levelling hills. Roads meandering through the hills will be constructed for passage of motor vehicles. Meanwhile, Bangladesh Christian Association strongly condemned the decision yesterday and protested the planned foundation-laying ceremony of the government. In a press release issued in the city it said the project would lead to the eviction of hundreds of tribal Khasia and Garo families living in the hills since long. It also said that the event coincides with the Easter Sunday, one of the biggest Christian festivals. Most of the tribals in the hills are Christians. "We are very worried by the decision which will also affect the day's celebration," said one of the association leaders (Source: The Daily Star 14-04-2001). After ten years the situation and attitude of the donor have not changed. Saturday September20, 2003 - Forestry project all right, but where will they go? Pinaki Roy, back from ModhupurAt least 29 indigenous Koch families along with five Bengali Muslim families are allegedly facing eviction from their homes in Modhupur Forest because of a controversial acacia tree plantation programme under the government's social forestry project funded by the Asian Development Bank (ADB). Modhupur forest officials last April reportedly issued an eviction notice to the residents of Kamarchala village of Aronkhola forest ranges where the Koches have lived for at least eight generations. Recently, the indigenous people have been subjected to fresh harassment and human rights abuses by forest guards, locals say. "The land was given to our ancestors Umesh Chandra and Mochu Ram Koch by the king of Natore in 1940. We also have documents to prove it but the forest officials have asked us to cut down all our fruit trees that we depend on for our livelihood and pull down our houses," said Nani Mohon Koch of Kamarchala, a retired Naek of Bangladesh Rifles (BDR). Kamarchala was named after Lakhai Kamar, a Koch blacksmith. The present Koch families of the village, most of whom are weavers, are the descendants of Lakhai Kamar and other contemporary Koch people. A few Koch families are also subsistence farmers like the Bangalees in the area. "Thrice they came to cut down our trees. But we did not let them by placing ourselves between their chainsaws and our trees," said Gouribala Koch. "Where would we go if they plant acacia on our land," said Gouribala who along with her mother Surobala and some other women came to the Dokhla forest range office premises to join a discussion meeting on the Modhupur National Park Development project. Some villagers of Kamarchala alleged the local forest officer has been threatening to evict them and demanding up to Tk 50,000 for fresh allocations of their land. "The forest beat officer has been threatening to evict us. He also asked money from me. If people protest, they are accused of stealing logs. Now we don't know what to do," said Shafiqul Islam, a farmer of Kamarchala. Mohammad Amir Hossain, range officer of the Aronkhola forest beat however denied the allegation. He said the villagers are partners in the social forestry project of the 1993 phase and the trees in their land were sold as per contract of the project. The villagers were supposed to plant only acacia trees under the contract under which they were allocated the land. But they violated the contract and planted bamboo, jackfruit, banana and mango trees. That is why the notice was issued," said Divisional Forest Officer Abu Hanif Patowari of Tangail forest beat when asked about the eviction notice. He however gave assurance that the Koch will not be evicted. The Modhupur Afforestation Programme was launched years ago as part of the government's plan for massive afforestation to attain a 20 per cent tree cover of the total land area by reforesting the previously recorded forest lands. But the indigenous peoples were neither consulted nor taken into account during implementation of the so-called participatory programme, which calls for taking into consideration of the sensitivities of indigenous peoples. An indigenous Koch family lazes out in the open but is always fearful of eviction because of a controversial acacia tree plantation in Modhupur Forest (The Daily Star, 20. 09. 03). Population 102,000 in Bangladesh (1993). Population 575,000 in India (1997 IMA). Population total both countries 650,000. Region:Meghalaya, Garo Hills District; West Assam, Goalpara, Kamrup, Karbi Anglong districts; Nagaland, Kohima District; Tripura, South Tripura District; West Bengal, Jalpaiguri and Cooch Behar districts. Also spoken in Bangladesh. Dec 4, 2003: Forest lands measuring about 46,000 acres are under the occupation of the vested quarters in Tangail district, it is learnt from a reliable source. Vast tracts of sal forest in Madhupur Garh have been grabbed by the vested quarters. It is gathered that a total of 1,93,236 acres of land in Tangail and Mymensingh districts are under the forest division. Of them, 63,832 acres are reserve forest and the rest acquired forest. Of the total land, 1,22,876 acres are in Tangail, 38,701 acres in Mymensingh, 19,468 acres in Sherpur, 10,365 acres in Jamalpur and 1,824 acres are in Netrakona districts. In 1949, the Zamindari system was abolished and the reserve forest land was turned into vested forest land. In 1950, the government acquired the forest land. From 1956 to 1992 the government published notifications five times and declared 63,832 acres as reserve forest. Now about 46,000 acres of forest land have been occupied by the vested quarters. The occupied lands are in Haludia, Chunia, Borobaid, Lohajuri, Gachabari, Digerbaid, Chotomohisha, Patpocha, Chatamari, Angaria, Kakrajani, Sainamari, Sadjupara mouza in Madhupur range, Arunkhola range, Dokhala range and National Park range. A section of corrupt officials of the Forest Department have leased out 5,003 acres of forest land among 3,263 persons by 'pattanamas' but no steps have been taken to repeal those 'pattanamas'. Vast tracts of natural forest land have now turned into arable land and houses have been constructed there. Fruits and vegetables, including pineapple, ginger, lemon, arum and banana are being produced on these lands. Immature sal and other timbers from these forests are being cut and sold unabatedly to brickfield owners. Besides, lands are being purchased and sold without registration. It is gathered that a section of forest officials, police and the vested quarters are engaged in denuding forests. About 40,522 acres of sal forest under the Social Forestry Programme was destroyed and 15,894 encroachers were rehabilitated. But it is alleged that violating the government rules the encroachers have been plundering the indigenous species of trees including sal, aguli, chaplish endangering the bio-diversity of the forest. Garo tribe of Madhupur Garh alleged that their life style and culture are at stake due to encroachment of the forest land. Plots were distributed to influential people instead of genuine ones under Social Forestry Programme, some people alleged (The Independent, Dec. 4, 2003)..
Police and Forest Rangers opened fire on an angry procession of Garo tribesmen at Madhupur Garh Friday leaving at least a young man dead and about 20 injured. Police admitted the death Piren Slan (20) in bullet but tribesmen claimed another unidentified young man died in the firing. They also claimed that about 20 people including women and children were injured. Most of them were admitted to Madhupur and Jalchhatra missionary hospitals. Police said more than five hundred people in a militant procession at about noon opposed construction of wall around the 3000-acre project- Forest Conservation and Echo Tourism - taken up by the Forest Department. Claiming the wall will go against the interest of the tribesmen living inside the project the procession demolished part of the wall at Jalabadha-Kakrakhuni area. Forest rangers opened fire to disperse the procession. As it became desperate police joined the rangers, officials said. Work on construction of the wall was suspended in July last in the face of strong protest of the Garo tribes living there. As construction resumed under the guard of rangers, tribesmen of Kakrakhuni, Joynagacha, Sadhurpara, Sataria and Bijoypur of Sonakuri union came out in a procession to protest the wall. On information deputy commissioner Kausar Zahura and police super Abdur Rahman Khan rushed to the troubled spot. On way they faced resistance near Madhupur National Park where angry tribesmen put up road barricade. They however managed to cross the barricade after an hour, officials said. Tension was prevailing among the Garos. (UNB, New Age January 4, 2004). Garos must be treated better. Probe their compatriot's death, punish culprits There must be a better way of addressing a community's grievances than by pulling a trigger at those trying to articulate them. And, a greater premium will be put on caution if the party which felt aggrieved is an ethnic group. For, the acid-test of a pluralistic democracy lies in treating minority voices with sympathy, equity and respect. Having said that, let's home in on what happened on Saturday revolving around a government forest conservation and eco-tourism project which was regarded by the Garos as posing a threat to their traditional lifestyle. Throwing all caution to the wind, police and forest rangers in Madhupur allegedly opened fire on the protestors apparently in presence of the project contractor and a local BNP leader. In the process, Piren Slan, a Garo youngster was killed and 25 others were injured. The project plan includes building a wall to ring the Madhupur forest to ward off what some officials said wood theft and land-grabbing. Apparently, it was exclusionary to the Garos or they have had their own perception of what the project might lead up to. Whatever the conceptual problems, since it is an eco-tourism project, it ought to retain, in fact, emphasise natural elements of landscape and other endowments. Some Garo people have complained of toll collection by forest employees which needs to be gone into. Basically, the relationship between the forest department or local administration and the Garos seems to have deteriorated over time. The fences must be mended first before the relationship can be restored to a level where an effective dialogue can take place. And the best way to ensure it would be to probe the firing incident and punish the culprits. These Garos in this area are mostly dependent on this forest for their livelihood. Therefore, the Garos have rightly understood that the creation of the Eco Park will limit their access to the forest and consequently it will appear as a threat to their lifestyle, livelihood and existence in turn. For this reason the Garos living in and around the Modhupur forest have united themselves to resist the construction of the Eco Park. As the Garos are one of the most backward ethnic communities in Bangladesh in terms of education, organisation and economy, they could not draw the attention of the civil society, press and other political parties at the initial stage when the government approved the project in 2000. Rather, this aboriginal community has roused against the mighty government with their blunt traditional weapons on January 3, 2004 after three years of the project initiation. In response to that weak resistance the police and forest rangers have answered with the fire arms. Consequently two Garo youths namely Utpal and Piren died on the spot and 25 others including women and children, were wounded. It has been assumed that the Eco Park is a threat for the existence of 2000 people in this area. Now the question is: who will be benefited from this project? Of course the beneficiaries are not the Garos whose umbilical cords are buried in the forest. The project will serve the interest of a section that has no fair relation with this forest. There are thousands of examples in the history of development which show that the planners do not take the problems of ethnic groups into account when they undertake any development project. One of the recent evidences of such indifferences of development planners to ethnic groups is our Kaptai Hydro Electric Project. The Kaptai Hydro Electric Project was planned to implement without considering the effect on the tribal communities living in Chittagong Hill Tracts (CHT) area. The concerned tribal mass was not discussed with before taking up the project. As a component of project the Kaptai dam was built on the Karnaphuli Rive in 1962 to create an artificial water reservoir that submerged 54,000 acres i.e a total of 40 per cent cultivable land belonging to the tribal people in this area. The Kaptai Lake is now an attractive tourist spot abounded with fish and produces 120 mega watts of electricity from which mostly the non-tribal people are being benefited. On the other hand, the inundation caused by the artificial lake pushed thousands of the tribal people deep into the dark forest and neighboring India. It is one of the major causes of the conflict between the government and indigenous people of CHT that caused instability and mounting tension in CHT area since then. If the project could have been planned through participatory approach the dissatisfaction of the hilly people could be lessened. The Modhupur Eco Park is going to be another example of non-participatory planning in the record of development initiatives. Government has followed the top down approach of planning. No discussion was held with the stakeholders particularly with the Garos about the project. So the Garos have perceived the project from the different angles that do not converge with the purpose of government. Government is defining the project as a "development" while Garos are taking it as counter development. So the conflict is imminent. Meanwhile Garos have vowed to continue their agitation until government abandoned this project. Other ethnic groups including the "Parbatya Chattagram Jana Sanghati Samity" have expressed their solidarity with the Garos. A tension is still prevailing in Modhupur forest. But this unpleasant situation could be avoided if the project could be planned following participatory approach considering the interest of the Garo community in and around the Modhupur Forest (Md. Firoj Alam, Daily Star, January 16, 2004). There are many basic necessities which are to be met by the government but without looking into the problems of the people, it has taken up some projects at the cost of the indigenous people. Far from the madding crowd of Dhaka, a township at Saturia, Manikganj recently sparkled with the resplendent cultural feast of the Mandi, a vibrant ethnic community struggling to keep their culture alive. Mandi, meaning human being, is an indigenous community, popularly known as Garo. The three-day (December 19-21) workshop created ripples among the local people who had scant knowledge about the splendid culture of the Mandis. The high point of the workshop was a cultural show by the Mandis of Pirgachha and the local cultural enthusiasts. SEHD's programme opened the window of opportunity for many local students to learn about the Garos who migrated to the northern part of greater Mymensingh from the Indian states of Meghalaya and Assam about 500 years ago. 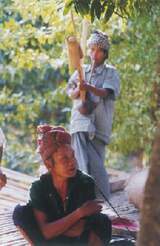 They are called Garos as they live in the Garo Hills. A few ethnologists, however, opine that the Garos are the offshoot of the Mongolian aborigines as there is a physical resemblance between the two. The Garos, once the follower of the ancient religion Sangsarek. Nature has an immense significance in the matriarchal society of the Garos which was evident in every step of their dance and other performances. 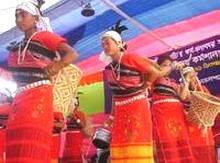 Attired in traditional dress, Dokmanda in bright red, yellow and black combination and silver jewellery on forehead, ear, waist and toe, eight beautiful teenaged girls performed their traditional Jhum Dance-- Aa Ba Cha Aa. The beats of Dama (drum) and Aduri (the horn made of ox- horn) were the traditional accompaniments with the dance. The dance sequence was a vivid depiction of the ancient cultivation practices of the Mandis. Clearing the jungle, sowing seeds and protecting the crops from the sparrows and preparing rice, and then getting ready for the festival Wangala--the dance had the minute details of the agriculture-oriented lifestyle of the Mandis. 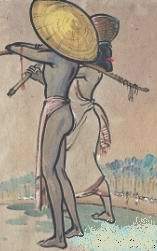 A dance item, titled Dukrushua, illustrated the intimate bond of the Mandis with the nature. Through the chirping of the doves, the sequence portrayed the friendly interaction of the birds with the sons of 'forest of Arden'. Nomul Roa was the tale of teenage girls and their joyous moments. The highlight of the show was, however, the Chambul Mesha, the monkey dance. Two boys wore artificial tails on their back and literally whirled them by twisting their hips, mesmerising the crowd. This item amused the audience and sent them into fits of laughter. The local young kids were seen trying their best to perform the monkey-act! After a romantic song, a lullaby dance titled Bisha Dim Dim depicted a Mandi mother trying hard to put her little baby to sleep. The local performances of songs and dances were performed during the intervals. Namey Namey Methila meaning 'thank you' in Mandi language were the last words uttered by little performers to the audience at the end of the colourful interaction between the ethnic people and Bangalees (Afsar Ahmed, Daily Star, December 22, 2004). Note: Now most of the garo tribe has been converted to christian. Why the native people can not keep their natural religion? There should be international agreement that natural people should be able to follow their own natural religion and keep traditional heritage. The science of modern ecology is the traditional way of life of traditional people. 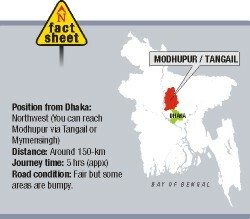 The indigenous Khasia and Garo people living in hills and forest lands in Moulvibazar district are in panic as a section of Bangalee land-grabbers are trying to evict them from their ancestral homes. The grabbers find the task easy when forest department takes up social afforestation programmes, leaders of indigenous people alleged while talking to this correspondent. At times the forest department also launches drive to 'recover' forestlands which makes indigenous people living in hills for generations 'common’ victims. Recently, panic gripped them as leaflets were distributed in Kulaura upazila by a fictitious organisation named Association for Social Afforestration Movement, calling upon 'non-tribal people to come forward to evict Garo and Khasia families from forestlands'. This has also created tension in the area. About 20,000 Khasia and Garo people live in different forest areas of Baralekha, Kulaura, Juri, Kamalgonj and Srimongal upazilas in Moulvibazar district. Their only occupation is betel leaf cultivation in hills. Plantation and preservation of forest is part of their life because they are solely dependent on that. After circulation of the leaflets, panic-stricken Khasia and Garo community leaders met with the Deputy Commissioner at Kulaura Upazila Nirbahi Officer's office on August 30. They included Prottush Askari of Amuli Pan Punjee (betel leaf growing area), Anit Yeang of Murai Chhera Pan Punjee and Flora Babli Talang of Khasia Students Association. At the meeting, the tribal leaders expressed their anxiety and sense of insecurity lodged a complaint with the DC that a section of forest department employees were threatening them to leave the areas. Meeting sources further said that the indigenous leaders told the DC that non-tribal people, with the help of the forest department officials, recently damaged betel leaf worth over Tk one lakh in some gardens and threatened them with eviction in the name of social afforestation programmes. The DC assured them of providing security and ordered police to find who circulated the leaflets. The indigenous leaders also handed over a memorandum to the DC to press their six-point demand. Anit Yeang of Murai Chhera Pan Punjee told this correspondent that an attempt was made during the tenure of Awami League government to establish an eco-park at Murai Chhera by evicting Khasias. Taking the opportunity, a section of local Bangalees tried to occupy their lands. 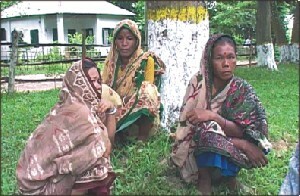 Several indigenous people were killed in clashes at the Khasia Pan Punjee in Kulaura upazila on July 25, 2002. Anit Yeang led the movement against the proposed e-park. He also alleged that a section of officials and political ifluentials indirectly support Bangalees to occupy lands of tribal people. When election comes, political leaders play a 'game of votes' by creating communal tension on the issue. When contacted over telephone, DC Md Eunusur Rahman said he informed higher authorities about the situation and also discussed it with leaders of Khasia and Garo communities. He said he will hold a meeting with indigenous leaders and officials of forest and revenue departments at Moulvibazar district headquarters soon to resolve the problem. Forest department officials could not be contacted despite repeated attempts in the last two days (Rajat Kanti Goswam, Daily Star, September 12, 2005). The forest department has started work for its social forestation programme by removing trees at Lobonchhara reserve forest under Monchhara beat of Kulaura forest range in Moulvibazar district. During a recent visit to Lobonchhara forest, this correspondent saw that a few labourers were cutting trees and bamboos to clean up the natural forest while 10 to 12 people were taking away bundles of just felled bamboos from the area. About 20 acres of this forestland has already been cleaned up. This forest is rich in the groves of 'muli' and 'khang' species of bamboos. When asked, the labourers said the forest officials have appointed them on daily wage basis to clean the jungle there. Poor people living at adjacent villages are taking away the felled trees and bamboos. The jungle is being cleaned up as the forest department has taken a programme to create social forest on 25 acres of land in Lobonchhara forest, forest officials said, adding that 2500 saplings of timber producing trees will be planted per acre of land. Mukhlesur Rahman, the range officer of forest department office at Kulaura, said, "Indigenous Khasia people living at Valaima Punjee near Lobonchhara have encroached lands of the forest during last few years. So the forest department has taken a social forestation programme to protect the forestland. After implementing the programme, poor people of all the communities including Khasia and Garo will be benefited as they will also be partner of this social forest." Protush Ashakra, vice president of 'Kubraj'- a local organisation of the Garo and the Khasia people, has termed the allegation of land encroachment by Khasia people as 'totally false and baseless'. "The indigenous people love trees like their children. The initiative taken by the forest department to create social forest by destroying the natural forest is not proper. Influential quarter of the society will be benefited from this social forest," he said. (Last Modified: June 13, 2010).